The City of San Ramon celebrated its 25th anniversary on July 1, 2008. Often new residents assume the city has always been in place, but many people still recall the efforts which led to the San Ramon’s successful incorporation vote on March 8, 1983. While the community began in the 1850s when an early post office was started, during the nineteenth and most of the twentieth centuries San Ramon was a tiny village surrounded by orchards. The Norris, Wiedemann, Glass, Boone and Bishop Ranches covered the area with agricultural enterprises which produced cattle, hay, grain, tomatoes, walnuts and pears. Many people remember the “San Ramon, Population 100” sign which was posted well into the 1960s. After World War II, California’s population began to expand and, when the freeway came to Danville in 1964 and through San Ramon in 1966, the whole San Ramon Valley began to change. The 1960 census had no designation at all for San Ramon but, by 1970, 4,084 people were listed as the “San Ramon Village”. Efforts to put a San Ramon Valley city in place began in Alamo in the fifties. There were four unsuccessful incorporation votes in 1964 (Alamo-Danville) and 1967, 1973 and 1976. 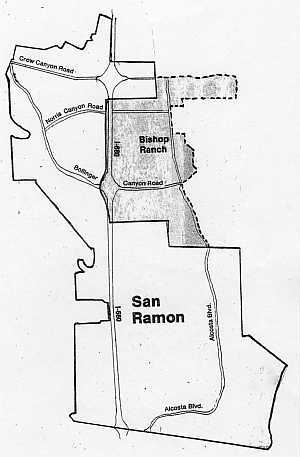 The last three included parts of San Ramon, excluding part or all of the Bishop Ranch area. The Ranch was always an issue for incorporation efforts. Western Electric bought the ranch in 1969 and opposed being included in any new city; later owners did the same. Incorporation efforts began as local leaders questioned development decisions by the Contra Costa County Planning Commission which met in Martinez. Even when the San Ramon Valley Area Planning Commission began in 1978, activists felt that wasn’t enough. They questioned whether taxes gathered in the valley were spent locally and wanted more police protection, local parks and their own locally elected leaders. Opponents feared the loss of community identity, worried about the possibility of higher taxes and were often satisfied with county government. San Ramon had some special challenges because their traditional downtown was in the north and new suburban development was in the south. South San Ramon and Dublin were initially planned and built by Volk-McLain in the early sixties. The Valley Community Services District (renamed DSRSD in 1977) was organized to provide water, sewer, fire and park services in this area. 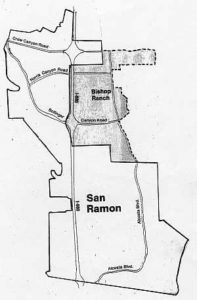 The 1967 incorporation proposal include Alamo, Danville and south San Ramon with an 1800 foot-wide “cherry stem” (thus avoiding Bishop Ranch) which linked the areas together. You can imagine the ridicule this boundary elicited. Leaders from the South San Ramon Homeowners Association weighed in during these discussions and, when Twin Creeks was built, the Homeowners Association of Twin Creeks spoke up. The San Ramon population grew from 12,782 (1975) to 22,356 (1980). These groups and others weighed in on the I680 freeway alignment, school unification, fire district organizations and proposed County development plans; some leaders ran for and won elected office on the DSRSD, school and fire boards. In 1979 an unusual cross-county border incorporation vote occured which included both San Ramon (Contra Costa County) and Dublin (Alameda County). San Ramon voted it down decisively. In 1981 Dublin voters incorporated as a city and, in 1982, Danville voters did the same. By 1980 San Ramon homeowners had organized the San Ramon Incorporation Study Committee and promoted an incorporation vote in 1983.